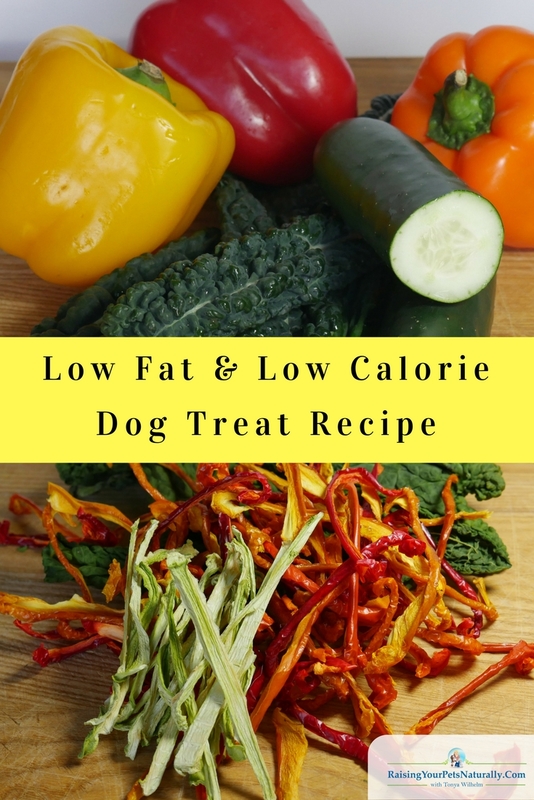 Low fat and low calorie treat recipe. OK, so Dexter The Dog isn’t fat, but he does need to lose a little weight. I always make a conscious effort to keep my pets at their ideal weight. No, I don’t feed my dog a prescription diet dog food (Nasty-Whole Grain Corn, Corn Gluten Meal, Chicken By-Product Meal, Soybean Mill Run, Powdered Cellulose, Soybean Meal, Chicken Liver Flavor, Dried Beet Pulp, Pork Flavor, Lactic Acid, Soybean Oil, Caramel Color ….) or any other processed food. 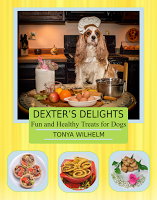 Dexter receives balanced and fresh home-cooked meals daily. No preservatives, no fillers, only real and healthy food. When I’m working on dog training exercises or just something to keep him busy, I’m careful to use his daily food calorie allotment with those “snacks.” However, with Dexter’s twice-a-day canine rehabilitation exercises and weekly sessions at the Animal Rehabilitation Facility, I have been going over his ideal calories, and he’s put on a few pounds. 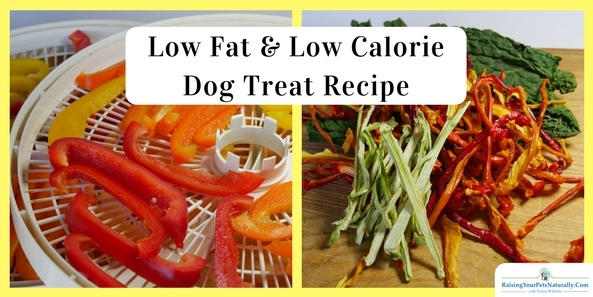 I want to help my dog lose weight with real food and exercise, not with a nasty, processed, low-fat dog food. Dexter’s home cooked dog food is low fat and healthy, what happened is I’ve added a lot of dog treat calories (dehydrated fruit) and with winter, less physical activity. The organic dehydrated fruit snacks are a healthy dog treat in moderation, but he’s been getting a lot! Dexter still needs a high reward system for his canine rehabilitation exercises because he’s still learning what to do and I’m asking him to challenge his body and mind daily. I have a few options for healthy dog treats for his dog training. One, I can cut his healthy dog food and use the ingredients as treats. For example, his meals are about 75-80% meat, so I can cut his portions back and give him meat for training, such as dehydrated beef or rabbit. Or, I can pick a dog-friendly vegetable and use those as training treats. I’m choosing the vegetables! 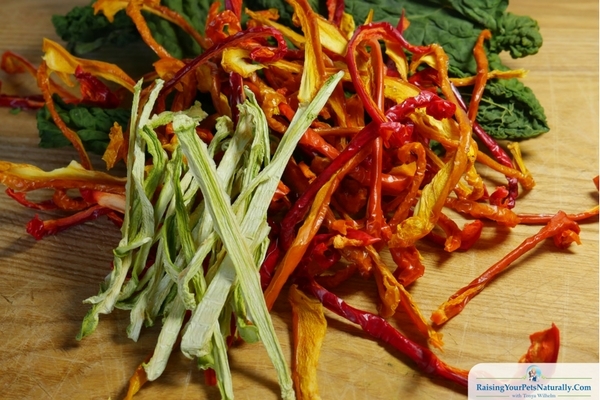 There are a lot of raw vegetables that are safe for dogs that I can choose from. However, vegetables are very fibrous and when they are raw, they are hard to digest. 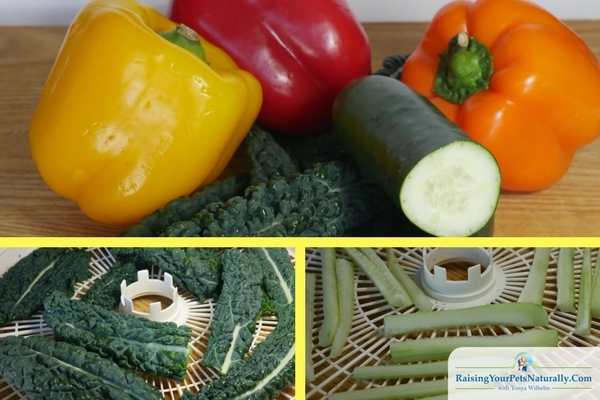 If I’m using Dexter’s daily vegetables for dog training, I really want him to digest them and receive the nutritional benefits, so I choose to dehydrate some organic vegetables for dog training. I dehydrated kale, peppers, and cucumbers. Do you make homemade dog or cat treats? Tell me in the comments.